The hot spring which seethes with the dry river bed in Kurobe Gorge from Unazuki for truck By-train 1 hour.Some the open-air baths and cave stone bath which stacked the digging stone for the dry river bed are enoughs.The hot spring which carried out the Founded or started to use this hot spring in Masatoshi Bun is a noted spring of canyon No. 1 chosen as the 100th elections of the noted spring.Please be soaked in a hot spring, look at a valley with year-long snow on the opposite shore, the clear stream of the Kurobe river, and the trees of 100 Mt. Nuki or a canyon, and melt into Nature.What is the starlit sky seen while hearing the cry of a sculpin night like? Although it is the open-air bath only for a lodger which is carrying out the hand structure at every rise of water by inmate full force, I have general opening of the daytime carried out for nothing. 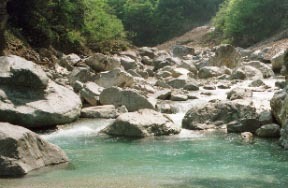 The Kurobe river and a kanetsuri open-air bath are upper parts just for a moment. Mountain stream fishing can also be enjoyed. The kanetsuri of evening.Daytime is completely a different thing. The slightly more tepid natural hot spring in an upper stream. It moves in a zigzag direction most narrowly at the Kurobe Kawamoto style, and they are a flow scenic spot and a special scenic spot special natural treasure. The parking in Kurobekyokoku Railway Unazuki Ekimae is convenient.